Being one of the leaders in the field of innovations in technology, products, and solutions, Samsung is all set to launch one of its premium quality smartphones i.e. Samsung Galaxy S8 Active. Banking upon a 4000mAh battery, this smartphone has been designed to boot on the Android Nougat v7.0. Housing a 64GB in-built storage, the smartphone runs on 4GB RAM and also comes with a microSD that can be further expanded up to 256GB. The Samsung Galaxy S8 price is expected to be around INR 61,999. - It features a display that has a screen resolution of 1440 x 2960 pixels. - The smartphone also has an internal memory of 64GB and functions in compliance with a 4GB RAM. - The microSD present in this phone can be expanded up to 256GB. - The 4000mAh battery is adept at keeping the user away from power bank for a good amount of time. - It will boot on the Android Nougat v7.0. - The camera unit of 12MP + 8MP can certainly do the job but perhaps is not what users of such premium quality phone look forward to have in their smartphones. Working in compliance with the Qualcomm MSM8998 Snapdragon 835, the Samsung Galaxy S8 Active has an Octa-core processor. Besides having a processor that can work at the frequency of 4x2.35 GHz, it boots on the Android Nougat v7.0. The Android Nougat is known for empowering the user to be able to switch between apps quickly as well as to have a multi-window video. What gets added to that is the capability to play graphically enriched 3D games without any glitch causing user dissatisfaction. The 12MP + 8MP camera may not be something that an user of such a premium quality phone would expect from the phone. But the camera certainly satisfies the need of arresting delightful moments of life in an efficient manner. The primary camera can also record video of 2160p and 1080p quality at 30 frames per second and 60 frames per second respectively. Other primary camera features are inclusive of autofocus, OIS, and LED flash. The camera of the Samsung Galaxy S8 also adorns itself with features like geo-tagging, simultaneous 4K video, 9MP image recording, touch focus, auto HDR, face/smile detection, and HDR. The 5.38-inch display present in this smartphone has been designed to have a screen resolution of 1440 x 2960 pixels. While the super AMOLED display ensures larger and higher definition displays with plenty of pixels, the display has a pixel density of 568 ppi. The TFT touch screen comes with a multi-touch display that allows the user to have more than one fingers recognized. Boasting of having an in-built storage of 64GB, the smartphone also carries 4GB RAM with it in order to ensure smooth operations. The microSD present in this phone can be expanded up to 256GB. The Li-Ion battery included in this smartphone has a capacity of 4000mAh with which the user can sustain for long time without feeling the need to use the charger or the power bank. 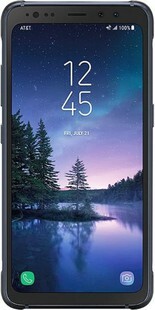 Samsung Galaxy S8 Active also comes with 2G/3G/4G/A-GPS/USB 3.1 connectivity along with features like iris scanner, rear mounted fingerprint, SpO2 etc. Despite having a comparatively less powerful camera unit of 12MP + 8MP, the presence of Android Nougat, 64GB in-built memory, microSD expandable up to 256GB, so on and so forth certainly make it a good choice for premium quality smartphone users. Samsung Galaxy S8 Active full specs and reviews as of Apr 2019. Buy it here!